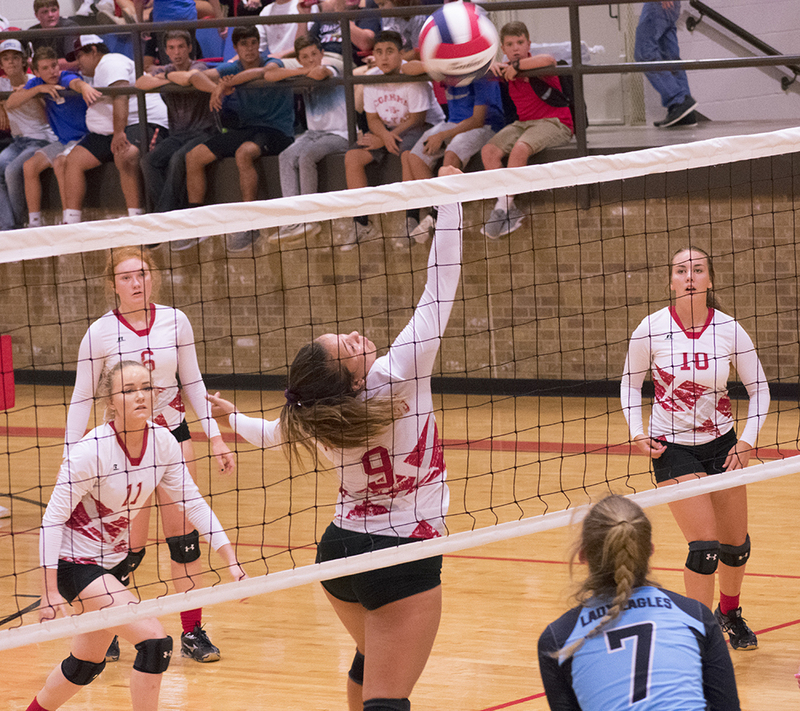 The TLCA-San Angelo volleyball varsity squad walked away with a win Tuesday night against the Coahoma Bulldogettes but the path to victory was not an easy one. The Lady Eagles won in four sets 24-26; 25-20; 12-25; 21-25 in hard fought action at the Coahoma Elementary School competition gym. At first it looked like the Eagles would earn an easy victory as the team quickly built a 0,6 lead in the first set and expanded it to a 9-point advantage by mid-match. However, the Bulldogettes came back with some exceptional defensive plays and saves to tie the score at 24-24. The Eagles earned the win 24-26. The second set started out in favor of the Lady Eagles once again until the Bulldogettes’ offense hit its stride taking the lead at 6-5. Both teams battled over control of the game trading the lead back in forth until the Coahoma squad hit high gear to earn the win 25-20. The TLCA girls were dominant through the third set (12-25) and mostly through the fourth to build a 9-point lead until the Coahoma girls pushed back narrowing the point deficit down to 4. The Lady Eagles salted away the fourth set 21-25. Paige Atkins led the Bulldogettes in kills with 9. Julia Mashburn racked up a total 11 assists for the game and Ashley Romero scored an ace in the match. In JV Action, JV White won both sets against TLCA 25-21, 25-21 and JV Red won in two, 25-16, 25-23. Up next, the Bulldogettes volleyball teams will take on Veribest in Veribest. JV Red begins play at 5:30 p.m. and varsity takes the floor at 6:30 p.m. Kills: Julia Mashburn, 1; Ashley Romero, 2; MaKynlee Overton, 4; Kirah Kimball, 2; Caitlyn Corley, 4; Paige Atkins, 9. Assists: Julia Mashburn, 11; Jaydan Mann, 3. Blocks: Ashley Romero, 1; MaKynlee Overton 4; Caitlyn Corley, 2; Paige Atkins, 1.